Diamond Tree Company provides Fort Collins, Windsor, Loveland, and the surrounding Northern Colorado community with stellar Tree Trimming and Tree Pruning at an affordable price. You most likely have spoken to a number of tree trimming companies throughout your years of home ownership. Most of the quotes that you have received have probably been so high that you were taken aback, and didn't know if you were ever going to be able to afford to trim, remove, or prune your precious trees. Most of the bigger companies around the Northern Colorado region upcharge more than Diamond Tree Company does because they have more staff to pay, more red tape to jump through, and more trucks to pay for. Here at Diamond Tree Company, we pride ourselves on being a small staff that does every job themselves. Brett, our ISA certified Arborist, is always on site, driving the truck, giving the bids, answering the phones, and seeing to it that your trees are given the proper attention they rightfully deserve. You rarely see new faces at Diamond Tree Company, because of the stellar work environment we create, and because of the way we treat our employees. We take great care to do the same with our customers. Every single one of our Fort Collins Tree Trimming clients is well taken care of, from the initial phone call to any consultations that take place, to the actual Tree Trimming & Pruning work that takes place. We carefully inspect your tree to determine which branches need to come down because of disease or infection, and which branches can stay attached because they are healthy. We also inspect your tree to make sure that it's safe around your home or commercial building, so that you and your property are not in harms way because of your tree. Our certified Arborist and owner is very well versed in all Tree Trimming and Pruning techniques, having worked for over 20 years on trimming and pruning trees of all different shapes, sizes, and types. 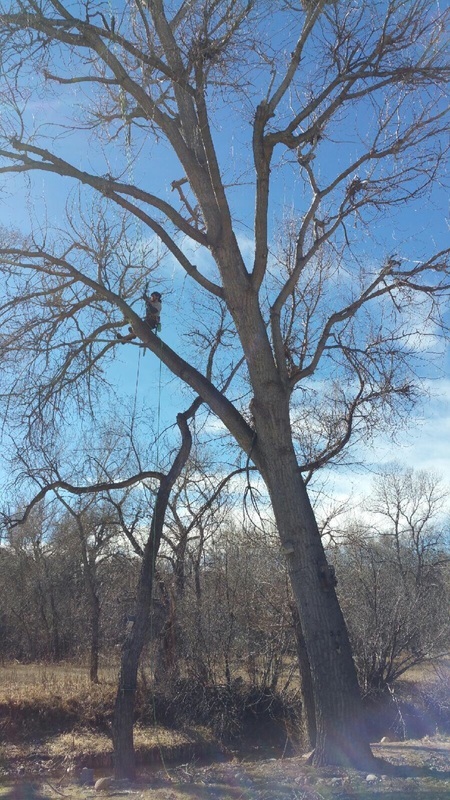 Whether you have a Cottonwood, Ash, Pine, Evergreen, Maple, or any other kind of tree that graces the Fort Collins and Northern Colorado landscape, Diamond Tree Company is the right company to take on the job. We are available for free estimates by calling 970-493-8733 or by completing one of the quote forms on the top of this page. We will do our very best to get back to you in a timely manner so that you can schedule your Tree Trimming & Pruning service today.